Boil potatoes in pressure cooker with skin in just 2 whistles. 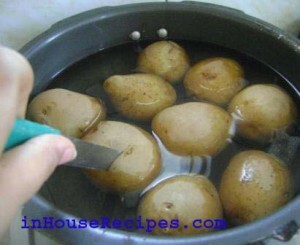 10 minute recipe and you only need enough water to get the potato completely submerged. 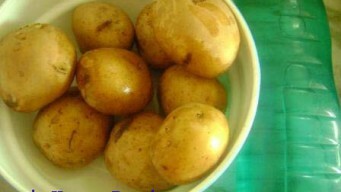 Boiled potatoes are a basic requirement of many recipes which have potato as ingredient. It's an easy process but only for those who know cooking. Novices can really mess it up like my husband did and hence motivated me to share this recipe. It sounds really easy, but when it comes to real time boiling, things can really go dirty. So, this recipe is dedicated to all who are just about to start their cooking journey. 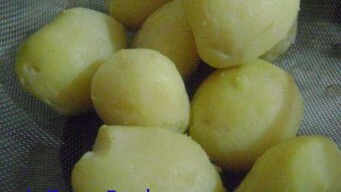 The total time required to boil potatoes in pressure cooker in about 11 minutes with just 1 minute kept for preparation! There are many ways of boiling a potato i.e. using an open container or boil in a cooker or use a microwave. We are going to learn the cooker method in this recipe. Ingredients to boil Potatoes in pressure cooker. Add the Potatoes and 1 liter of Water in a pressure cooker. 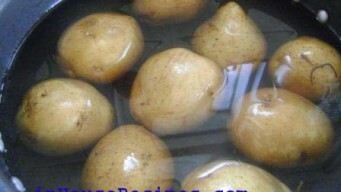 Make sure that all potatoes are completely submerged in water. If required, add more water. Also, the cooker should be big enough to hold all potatoes. The total water level with potatoes should not be more than 75% of cooker depth. Add the Potatoes and 1 liter of Water in a pressure cooker. 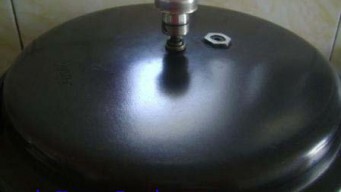 Cover the lid of the cooker. One of the question that we are asked most is about the number of whistles for boiling potatoes in pressure cooker. Here is the answer: After 2 whistles on high flame, switch OFF the stove. Do not open the lid of the cooker till it has pressure in it. Let all the steam go OFF on its own. Once steam has vanished, open the lid of the cooker and check whether Potatoes are properly boiled or not. To check: Poke the knife in one of the Potato, if it goes in easily, it means your job is done. Else, they might need some more time on stove. You can safely keep them again on high flame and wait for another whistle and then switch off the stove. Don’t forget to wait for steam to vanish again. In normal conditions, you would not need more than 2 whistles as mentioned in the above step. But, in case the potatoes are really hard or the pressure cooker has old rubber or something else is not working, you may need this one more step of whistle. Boiled Potatoes are ready to use. Peel their skin and they are now ready to be used in potato based recipes. Enjoy. How To Boil Baby Potatoes In Pressure Cooker? Well, there is no difference between the way we can boil normal potatoes or for that matter any other type of Potato. Hence, you can certainly boil the baby potatoes also using the recipe mentioned above. As you already know by this time, this recipe talks about boiling potatoes with skin. So, you can follow it easily. Boil Potatoes For Mashed Potatoes or Salad? Boiling potatoes is a common process for varying recipes including Aloo Tikki, Mashed Potatoes or Salad. The only consideration that might come up although very rare, in some specific recipes is the level of boiling of Potatoes. This can be controlled by increasing and decreasing the boiling time appropriately. Boil Potatoes For Home Fries? Generally, you do not need to boil potatoes to make home fries. Fries can be made straight from non-boiled or raw potatoes. But, if your recipe specifically requires the boiled potato, you can use the above recipe with no doubt.Let us know your questions, if any in the comments below.